Why Fingers Wrinkle in Water ?? | Do You Know? Why Fingers Wrinkle in Water ?? Simple Answer : To Give you more grip. But How? Well, see the explanation. Even though you can't see it, your skin is covered with its own special oil called sebum . Sebum is found on the outermost layer of skin. Sebum moistens, or lubricates, and protects your skin. It also makes your skin a bit waterproof. That's why water runs off your skin when you wash your hands, instead of soaking it in like a sponge would. Also, The skin's outermost layer, the epidermis, is responsible for this wrinkly reaction, which usually occurs after you've spent about half an hour in the water. The epidermis contains the protein keratin, which strengthens your skin and helps keep it moist. Dead keratin cells make up the epidermis' own surface layer known as the stratum corneum, which is Latin for "horned layer". These dead keratin cells in the stratum corneum absorb water easily and start to swell after extended periods in the water, but the living keratin cells deeper in the skin do not. As the dead cell layer expands, it begins to take up more surface area, but it's still connected to the living cells beneath and doesn't have anywhere to go. As a result, the stratum corneum wrinkles to give the temporary new surface area someplace to go . Researchers are studying other theories for what might help cause the wrinkling, such as the whether the constriction of blood vessels is related to it. 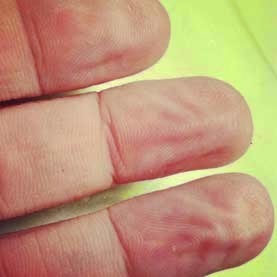 But if most of your body is submerged in the water, why do these wrinkles occur only on the hands and feet and not on other areas? Because they get so much use, the palms of your hands and the soles of your feet have thicker skin -- and therefore a thicker layer of keratin -- than the rest of your body. This makes them especially susceptible to wrinkling in water.